Torque is applied to the fastener in an effort to elastically deform the bolt shank. In the case of bolts and nuts, this elastic deformation between the bolt head and the nut is critical in order to create tension or clamping force to hold the joint together. The amount of torque applied is a function of the frictional forces and bolt diameter and is typically calculated utilizing a clamp load equaling 60-70% of the yield. 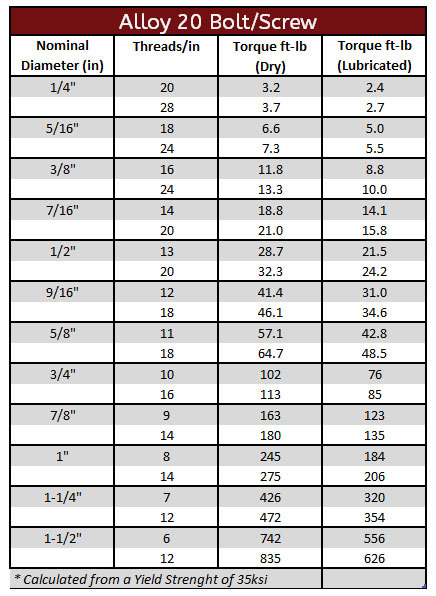 Below are guides that show these calculations for a variety of materials, bolts sizes and thread counts over a range of frictional conditions. 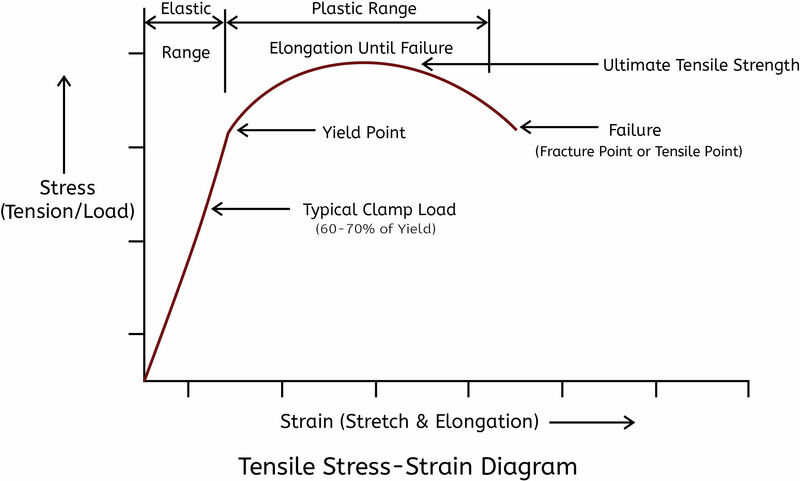 CAUTION: Care should be used when applying a formula for torque/tension relationships. Torque is only an indirect indication of tension. Under/over tightening of fasteners can result in costly equipment failure or personal injury. All data included in this chart is advisory only and its use by anyone is voluntary. The data provided should be used as a guide, but actual material strengths and fastener conditions may vary. In developing this information, Extreme Bolt & Fastener, LLC has made a determined effort to present its contents accurately. Fastenal. (2009). [Illustration of Tensile: Stress-Strain Relationship] Bolted Joint Design: Mechanical Properties of Steel Fasteners in Service.